In the Wake of Heroes available at IndyPlanet and ComicsMonkey! Wantagh, NY – Operation: In the Wake of Heroes has commenced and is now available now at IndyPlanet and ComicsMonkey. The 16-page issue from Blue Eye Comics confronts the nightmares of elder care in America. In the Wake of Heroes follows Colonel Jason Roman as he watches his buddies experience the harsh truths of ageism, family neglect and the issues of senior living. Tired of seeing his generation left behind by society, the Colonel recruits a wild bunch of geriatrics and launches a full scale kamikaze-style operation across the globe. In return, he hopes to provide his peers with some final moments of dignity and a fully funded military funeral. 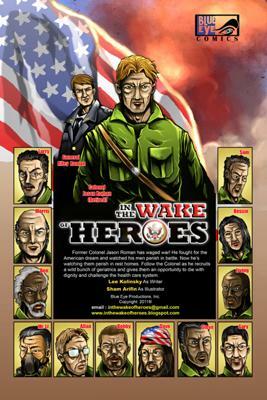 Produced by Blue Eye Comics, In the Wake of Heroes is a new series written and created by Lee Kolinsky with art by Sham Arifin. For more information contact inthewakeofheroes@gmail.com or go to www.inthewakeofheroes.blogspot.com . Join in and write your own page! It's easy to do. How? Simply click here to return to Comic Book FAQS.